Who doesn’t love an airbrushed makeup look? If you’re looking into getting that look for yourself every day, you’re going to need an airbrush and the best airbrush makeup that you can find. So if you already have the equipment you’ll need to get started, then let’s look into the foundation, shall we? We spent days researching and reviewing some of the best airbrush makeup brands in the world, compiling a list of our favorites. In this top ten list, we’ll break down each of those products into some basic stats, so you can pick your new favorite airbrush makeup with ease. Here are each of those stats that we’ll break down for you. Shade - What color is the makeup? This is the most important stat, as we want to make sure that the color of the foundation matches your skin color. Finish - Is the finish matte, satin, silk? Whatever look you’re going for, we’ll let you know if each of these ten makeup matches what you want. Skin Type - What skin type is this makeup best for? Normal, oily, dry? Maybe all three? We’ll break down which types match with which makeup. Fragrance-Free - Does the makeup have fragrance in it? Some sensitive skin can be irritated by fragrances, so we’ll let you know if it has it or not. Oil-Free - Is makeup oil-free? Oil-free makeup helps to keep from adding oils to already oily skin. So look for oil-free if you have oily skin. Weight - How much do you get in each bottle? Some makeup will come in a variety of sizes, so we’ll let you know what all the sizes are here in this stat. Now onto the top ten best airbrush foundations! Although we love every single makeup on this list (and we’ll tell you why in just a moment), we have two that really stand out that you should take a look at first, especially if you are in a hurry. The first is the Top Pick, which was our overall favorite airbrush foundation. The second is our Budget Pick, a great makeup you can buy without eating up your makeup budget. Now, let’s get going onto those airbrush makeup reviews! We love the Sephora airbrush makeup! It comes in a variety of tones and shades, making it ideal for most skin colors. The finish is satin and smooth, helping to hide imperfections. It feels weightless like you are wearing nothing at all. The micro-fine pigments ensure a seamless, flawless look that is great for just about any kind of skin, from oily to dry and everything in between. Our favorite part of this makeup is that you don’t need an airbrushing kit to apply it; it already comes in a handy spray can that makes application simple. All you have to do it hold it ten inches away from your face and spray after making sure to cover areas where you don’t want the makeup! You can also do a light application by spraying it onto a cotton applicator as well. Get a flawless look with Sephora! Looking for an airbrush makeup that works with or without an airbrush? 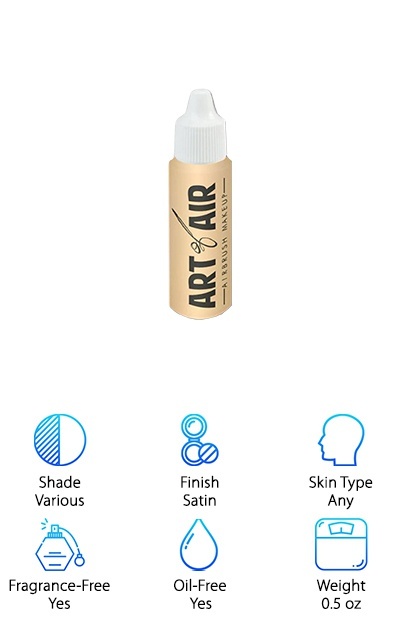 Then check out Art of Air Makeup! It’s an oil-free, fragrance-free, water-resistant, and smudge proof. This makeup is great for sensitive skin since it’s mineral based and excludes preservatives and other harsh chemicals. In an airbrush gun, the Art of Air Makeup lays a perfect layer of foundation over your face, giving your skin a satin-finish that looked as flawless as possible. Without an airbrush, this makeup can also be applied with a sponge or pad, just like traditional foundation. And the best part about this makeup is that it lasts a long time. No more touch ups throughout the day! So grab the airbrush makeup that is hypoallergenic and strong; look for Art of Air Makeup today! Tru Airbrush Makeup is a water- and mineral-based makeup that’s ready for just about anything. It stays put in almost any weather, helping you to look great no matter how awful it is outside. This airbrush makeup uses pure ingredients to help keep skin looking great, even underneath your makeup. In an effort to protect skin and pores, Tru Airbrush Makeup avoid harsh chemicals and allows your skin to breathe through their awesome makeup. This stuff is made from a soy protein that elongated wear without irritating skin. And the best part? 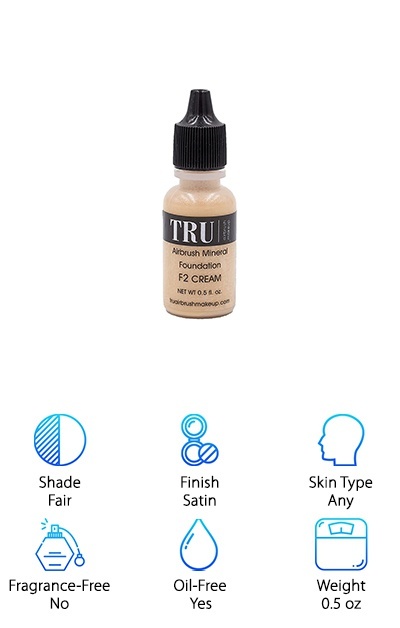 The Tru Airbrush Makeup can cover just about anything, including acne scars, pimples, uneven skin, redness and irritation, and any other blemishes. We love the Tru Airbrush Makeup for its purity and its quality, and we’re pretty sure that you’ll love it too! Here is another great airbrush makeup that doesn’t need an airbrush gun! This makeup has been aerosolized for ease of use. ERA Foundation Makeup is designed to be gentle. This oil-free makeup avoids harsh chemicals or anything that might block your pores. Along with that, you also get a boost to your skin through vitamins and botanicals blended into the makeup. This can weighs about 2.25 ounces, giving you plenty of makeup that will last you many applications. We love how true to color the ERA Foundation Makeup is; it’s easy to match your skin color on the ERA website. 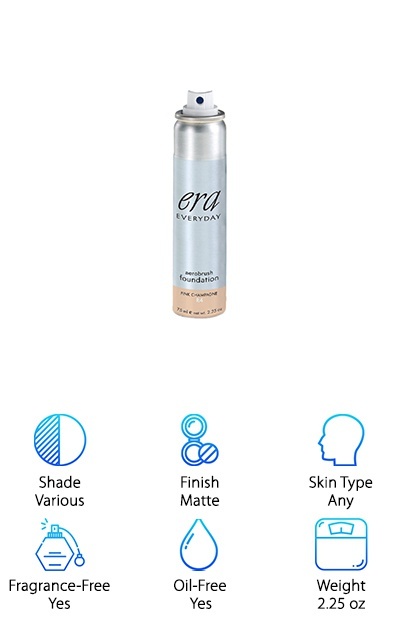 So if you’re looking for a flawless look that’s good for your skin, matches your skin tone, and doesn’t feel like cakey, thick makeup, give ERA Foundation Makeup a try. We’re pretty sure you’ll love it! Want a flawless, natural look without much effort? 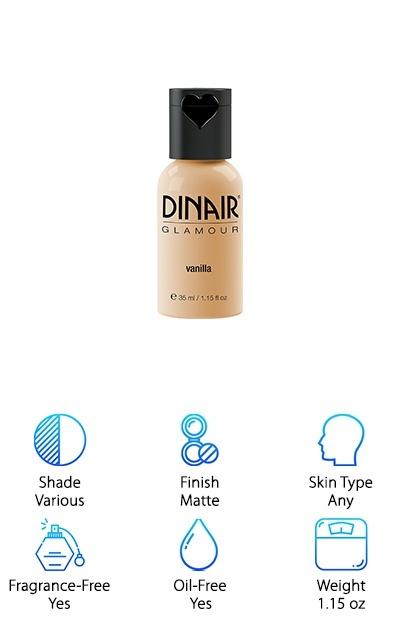 If you have an airbrush gun and you want a great makeup for it, check out Dinair Makeup Foundation. It’s oil-free and okay for any skin type. You get light coverage with a matte finish, giving a flawless look to your makeup regimen. It sets on contact without the use of any powders or finishes; you don’t need to add anything more to your face to keep it in place. It also resists water and rubbing, so you won’t have to worry about losing it on your clothing either. One application usually lasts about 18 hours, too! This water-based makeup is easy on your skin and feels like you aren’t wearing any makeup at all! And there’s nothing we love more than a weightless, flawless finish! Want some vitamin E and skin conditioners with your daily makeup application? Glam Air airbrush Makeup Matte Finish has it! This airbrush makeup is water-based, helping to prevent makeup damage to your skin. This makeup is a matte finish, perfect for oily to normal skin. It can cover up red spots, irritation, acne, and more. We love how fast and easy it is to apply this makeup. It really gives you a camera-ready look that you usually only see on models and actresses. 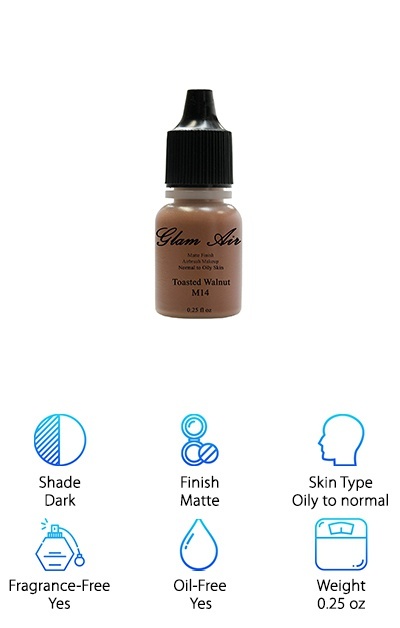 So if you are looking for a rich look to replace you everyday makeup routine, check out Glamair M14 Foundation. It’s hard not to fall in love with it! And our favorite part, it sets to your skin for an all day, weightless, flawless look that doesn’t quit. Want a makeup great for sensitive skin? Tickled Pink Foundation is an airbrush makeup that is aloe-based, making it great for your skin as well as hypoallergenic for most people! It is perfectly formulated for the most sensitive of skin and yet is ready to stay flawless all day long with you. It’s waterproof, high in antioxidants, and is gentle and caring to your skin. Not only that, but it’s also really, really inexpensive! Compared to a lot of brands, this makeup gives you a lot (10 whole ounces!) and it is still cheap! It is also available in 40-ounce and 20-ounce sizes if you try it and love it. Which, we’re pretty sure you will once you give it a try! And the best part: this makeup is 89% organic too! The Glamair M8 Foundation is the airbrush makeup that will stick with you all day long. It never cakes up, never feels heavy, and usually doesn't need reapplications during the day. 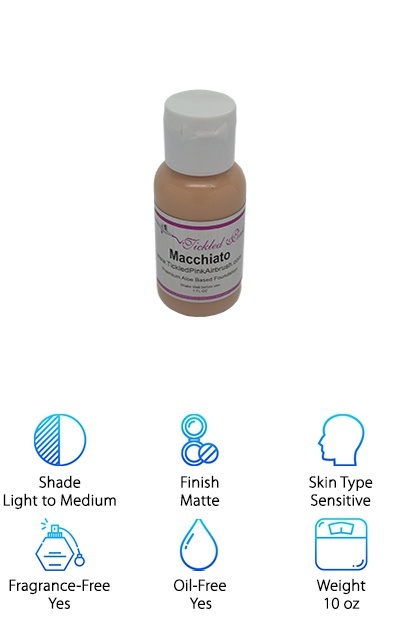 This matte makeup is for medium skin, and it comes in a variety of shades (this particular color is for peachy light skin or live skin that does not burn easily). With your purchase, you get a half an ounce of some of the world’s best airbrushing makeup (in our opinion). 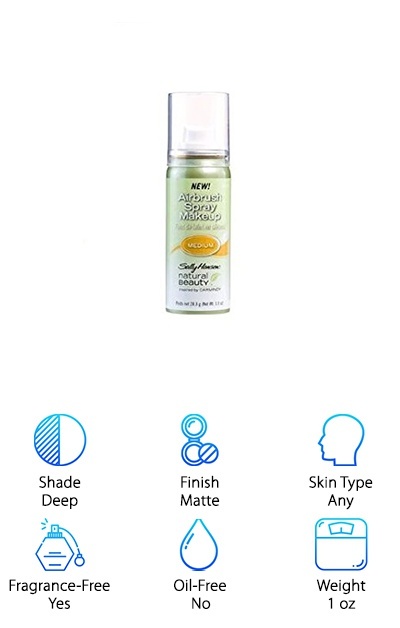 We love it for its simple coverage; it just sprays on and you are set for the whole day. There’s nothing here that we don’t love! It really gives you a flawless finish without the mess or effort of traditional makeup. So check out the Glamair M8 Foundation if you are looking for an easy and fabulous look! Sally Hansen has been known for years to make great makeup products that really sell themselves. Her spray-on makeup is no exception! This one-ounce spray can of foundation goodness is easy to apply (no airbrushing gun needed!) and even easier to love. It is made with olive oil extract, chamomile, and vitamin A, making it great for your skin and reducing or eliminating makeup damage. It’s perfect no matter your skin type, your coloring, or your makeup regimine; this spray-on is perfect no matter what your look is! It comes in a variety of colors, but this particular color is for designed for darker, Caucasian skin. With its smooth application, broad range of colors, and the ease of use, we can’t help but love the Sally Hansen Makeup. We’re pretty sure you’ll love it too! Looking to cover up more than just a few spots? Luminess Matte Finish can cover almost anything from scars, rosacea, bruises, tattoos, and other color imperfections. This stuff is seriously serious! It is designed for oily and acne-prone skin. Although the cover is complete, it still doesn’t feel heavy or cakey; the makeup is very lightweight and comfortable enough to wear all day. It really sticks around too; one application usually lasts about 18 hours! This stuff is hypoallergenic, smudge-resistant, oil-free, and easy to use. All you need is airbrush and any color flaws in your skin will disappear! But our favorite part of Luminess Matte Finish is it’s beautiful, camera-ready, flawless powder matte finish that looks like you paid hundreds of dollars for it! 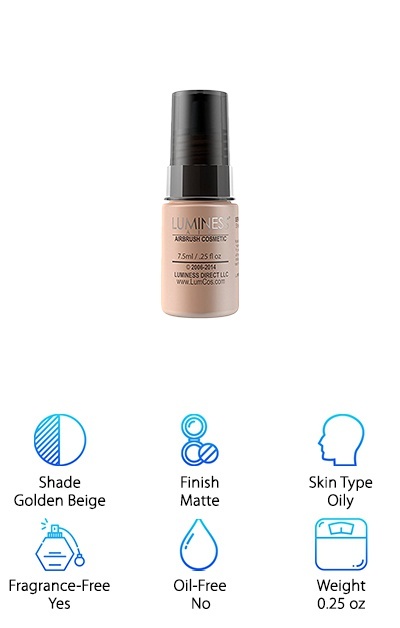 So if you want lightweight but full coverage, check out Luminess Matte Finish!